Fig. 1 Main screen. 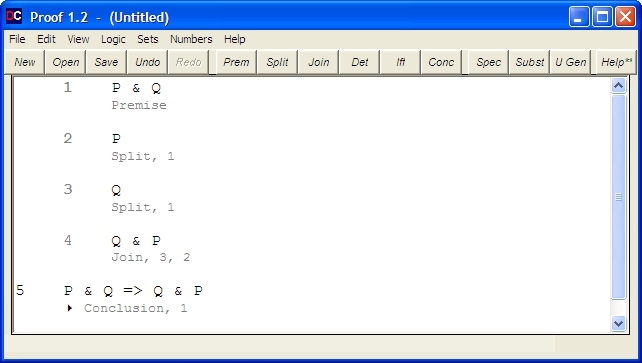 Display of proof that the AND-operator (&) is commutative. Fig. 2 Logic menu. The rules of inference. Fig. 3 Premise form. Used here to enter and verify the premise 'P & Q'. Fig. 4 Substitution form. Used here to substitute 'a' for 'b' on line 2 of a proof. all natural numbers x, we have ~x=x+1.